The Mandarin Oriental Miami sits on Brickell Key, a tiny peninsula that juts into Biscayne Bay, and whenever I am there it feels as if I am on a window-walled cruise ship, albeit one decorated with contemporary elegance, natural woods, bamboo-flooring, and rice paper decor. From the pool deck, it’s footsteps to the bay-front path that circles the property and from six of the fifth floor spa suites – including the couple’s suite and the Thai massage suites – the views of boats on the bay through enormous glass window walls are ever-so-much-more fascinating than an expanse of ocean. 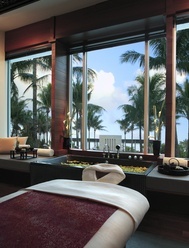 The serene and spacious Acqualina Spa by ESPA, on Sunny Isles Beach, is indoors. Yet, my post-massage lunch there was served on the private-to-spa-guests terrace at a table adjacent to a hot-tub and facing spot-on scenery: palm trees, broad beach, and the infinite ocean. Drive about 150 blocks south – still on hotel and apartment lined Collins Avenue – to reach The Setai South Beach in the hip Art Deco district. This tiny jewel of a spa has only four spa suites; each is located on the second floor and has a grand picture window that overlooks the pool, the umbrella-studded sand, and the Atlantic. In addition to Asian design elements and Oriental healing therapies – Shiatsu, Thai massage, and foot services – the three spas serve exceptionally delicious Asian-inspired cuisine. At ESPA at Acqualina Resort, my enticing bento box tray was fitted with individual dishes: grilled chicken, a mélange of fresh vegetables, berries, and a green salad. The Mandarin’s spicy spa cuisine also arrived in a bento box but the flavors had a decidedly Thai twist: a Thai mango salad with mango, carrots, scallions, chili peppers, and cilantro accompanied a spicy beef stir-fry with Kobe skirt strips, garlic, and Serrano chilies served with mint coconut curry rice. The in-room dining menu at The Setai is served to guests on the plush couches that stud the poolside and offerings include Thai, Chinese, and Indian fare, such as prawn soup with lemongrass and ginger and green papaya salad. For Asian ambiance in a waterfront setting, Miami beckons!